The wonderful iPhone to Computer Transfer Ultimate can export all your iPhone files like music, movies, ringtones, Camera Roll, etc. to PC easily. You can back up the contacts and SMS with no limitation. 4Videosoft iPhone to Computer Transfer Ultimate can help you transfer your iPhone files like music, movie, photos and more to your computer with no limitation. You are allowed to back up the SMS and Contacts for safety. Do you want to leave your music, movies, photos, etc. off your iPhone to save more available space? The iPhone to Computer Transfer Ultimate can satisfy the requirement. It enables you to transfer your iPhone files to computer freely. You can export the music, movies, photos, e-books, TV Shows, Podcasts, iTunes U, Camera Roll, Audio Books, and ringtone files and so on to your PC easily. What’s more, you are allowed to backup SMS and Contacts without any limitation. You can know the detailed information about your devices such as version, available space, type and serial number directly when connecting your device to the program. 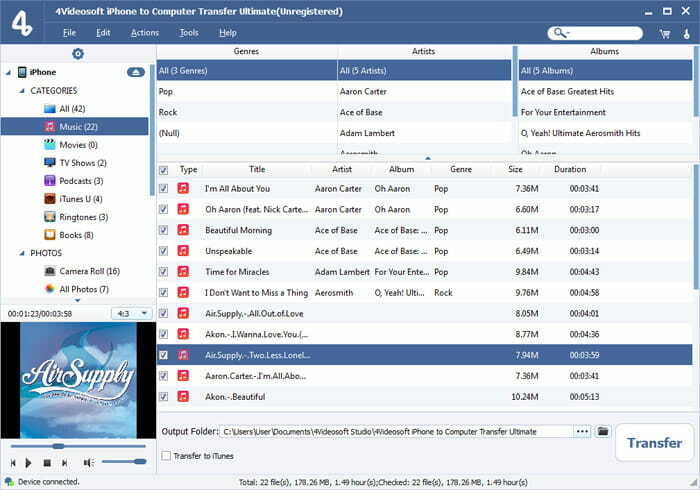 It enables you to create new playlist easily so that you can arrange your files conveniently. And you can preview the source video freely. 4Videosoft iPhone to Computer Transfer Ultimate highly supports iPhone 5, iPhone 4S, iPad 4, iPad mini, iPod nano, iPod touch and more. It allows you to finish the whole process without any loss. You can convert the DVD movies to general popular videos like MP4, MOV, AVI, FLV, WMV and more. This nice DVD Ripper can also help you edit the output video with the colorful editing functions.